Getting and Setting Managed Metadata Fields in SharePoint 2013 Workflows. In this post, I'll explain the concepts behind my approach and explain why you can't use built-in list actions to work with managed metadata fields. Custom Workflow Activity for Getting Managed Metadata Field Values (this post). 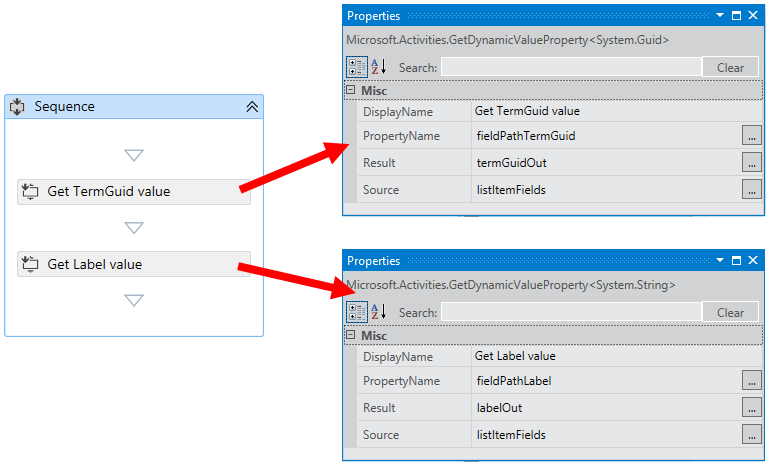 In this post, I'll walk you through how to build a custom workflow activity in Visual Studio that gets managed metadata field values from a list item. I'll assume you know the basics of how to build and deploy custom workflow activities - if you need a bit more detail on the deployment side of things, have a read through my first post on custom workflow activities. For now, let's just say I've created a new custom workflow activity named Get MMS Field Value in Visual Studio. The activity will get the value of a managed metadata field from the current list item, so we only need the caller to provide one argument value - the name of the field (mmsFieldName). We want to return two values to the caller: the term GUID (termGuidOut) and the term label integer (labelOut). We'll use listItemFields to store a JSON representation of the list item. The DynamicValue type is perfect for storing and manipulating JSON data. We'll use fieldPathTermGuid and fieldPathLabel to build the XPath expressions we need in order to isolate and extract the term GUID and the term label from the list item JSON. Get the current list item. Build an XPath expression to find the TermGuid property of the specified managed metadata field value. Build an XPath expression to find the Label property of the specified managed metadata field value. Add a try-catch block so we can catch any errors when we parse the list item. Within the try block, use the XPath expression we created earlier to get the TermGuid property from the managed metadata field value. Within the try block, use the XPath expression we created earlier to get the Label property from the managed metadata field value. Let's walk through each of these in turn. I've used a LookupSPListItem activity to do this. The activity returns the JSON representation of the list item as a DynamicValue instance, which I've assigned to the listItemFields variable. Note that the results property actually contains an array of one result, so we use results(0) to get the first object in the array. Remember that we're not using the XPath expression at this stage - we're just building an XPath expression from the workflow variables to use in a later task. 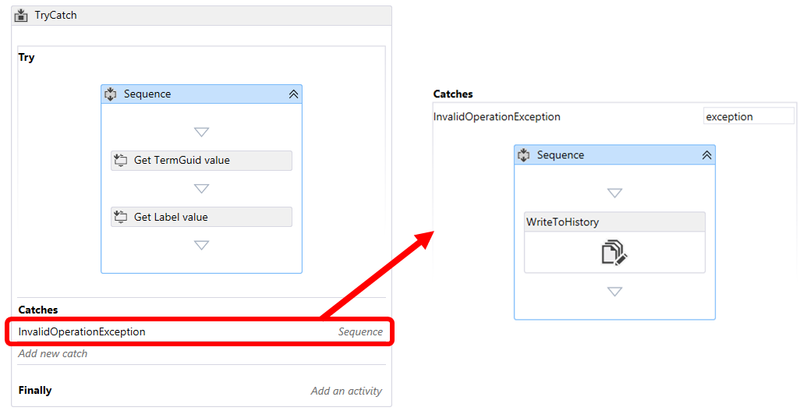 Here you can see that we attempt to get the salient managed metadata field properties within a Try block, and we look for an InvalidOperationException in the Catch block. We'll look more closely at the activities within the Try and Catch blocks in the next step. For now, notice that the activities within the Try and Catch blocks are wrapped in Sequence activities. In a production scenario you will probably want to implement a more comprehensive error handling strategy, but for this proof-of-concept scenario I'm mainly interested in catching the common invalid operation exceptions. The Source property is the JSON representation of our list item. The PropertyName property is the XPath expression that finds our TermGuid or Label property. The Result property is the output argument that exposes each property to SharePoint Designer workflows. As you can see from the Sentence attribute in the RuleDesigner element, we require the workflow designer to specify the name of the managed metadata field, and we return the term GUID and the term label integer value. Note that in the parameter definition for the mmsFieldName argument, we specify a DesignerType of FieldNames. This enables the workflow designer to select the name of the managed metadata field from a list of all the fields in the current list item. In this case, I've created a really simple SharePoint Designer workflow to test my custom activity. I use the custom activity to get the term GUID and term label integer properties from a managed metadata field named Customer, and I write the values to the workflow history list. In the next post, I'll look at the other half of the problem - using these managed metadata field properties to update a managed metadata field in another list. I'm running into an issue with this. I'm running this on a SharePoint online site. I publish the solution and get the wsp and upload it to the features and all that jazz. But in the actual workflow my arguments are acting funny. I'm unable to click on the field to activate the field dropdown, and the output variables don't show up and all I get is the name rather than Variable: termGuid. When I go into properties for that activity i'm then able to get the field drop down. But the termGuid comes back with 'no builder specified' and LabelInt acts like a default input field. I've looked over the actions file a lot and unable to find and error. I'm relativity new to custom workflows, so any help would be amazing. Sorry I missed this first time around. I'm aware of the issue you're referring to, and as far as I can tell it's a bug/limitation in the SharePoint Designer UI. As Amon points out, opening up the activity properties renders a dropdown list that works as expected - that's the workaround I use, it's a couple of extra clicks, but it's functional and reliable. I don't believe there's anything you can change in the actions file that will alter this behaviour. You need to add the UsesCurrentItem="true" attribute to the Action element to make the FieldNames designer work correctly. (Action Name="Get MMS Field Value" ClassName="ManagedMetadataActivities.GetManagedMetadataFieldValue"